The four members of SHINee had returned back to their home in Korea only a day after the show. Usually a stunt like that would&apos;ve ended their career, but they had gained more support from their fans than they&apos;d ever expected. All over the media was the news of Taemin and Jonghyun&apos;s kiss, but even more so, Taemin&apos;s apology to Minho. So many questions were left unanswered, even between the five boys. None of them had spoken to each other since the show - with maybe a few exceptions when it came to Jonghyun and Key. That didn&apos;t stop Onew from attempting to cheer them all up, though. Taemin had thought about calling his Minho, but he just couldn&apos;t bring himself to do it. He had told himself he&apos;d rather talk to him in person, but actually he knew that he was just trying to avoid him all together. He couldn&apos;t hide forever, though. Sooner or later, he&apos;d have to man up and explain. Taemin couldn&apos;t help but notice that Jonghyun and Key had become even closer the past couple of hours, in the most awkwardest of ways. It looked as if they weren&apos;t quite sure how to act around each other, but still they were holding hands at every given moment, giggling at their inside jokes and generally being flirty. Usually they saved that for the cameras, as terrible as it sounded. They arrived back at their home to find Minho chilling out on the sofa with his injured foot resting up against the coffee table. "Minho!" Onew yelled, rushing over to hug him. Key and Jonghyun laughed, walking over to meet their friend. It felt like they hadn&apos;t seen him for years, though it had only been a couple of days. Taemin bet they all felt guilty they had left him behind for the tour. "When did you get out of hospital?" Jonghyun asked, taking a seat beside Minho, clearly worn out by all the traveling they had done. "This morning," Minho said, sighing. "I don&apos;t know why they kept me in there for so long." Taemin stood awkwardly by the front door as they had their conversation, unsure if it was safe to greet his boyfriend. "Minho," Taemin said softly as he came into view. Key and Jonghyun got up and left to unpack their things in their tiny bedroom, and Onew was raiding the kitchen, moaning about the lack of food. That just left Taemin alone with the scowling Minho. 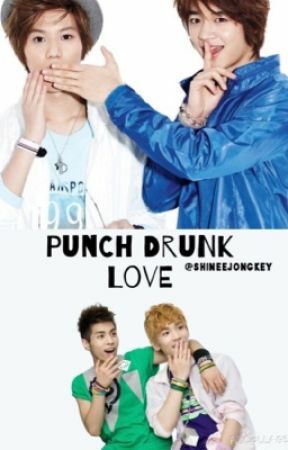 It had been only a day since Jonghyun had kissed Key. And it was clear that neither of them knew how to act around each other anymore. Jonghyun wasn&apos;t even sure if Key felt any differently towards him, but he guessed that Key liked him back - at least a little bit. Jonghyun just didn&apos;t know how to proceed. So many things could&apos;ve gone wrong and he was just glad that it had turned out fine. He was just glad that Key didn&apos;t think any less of him. However, the two of them had gained some odd looks from Onew; Taemin seemed too lost in his own thoughts to care about anything, and Jonghyun couldn&apos;t help but feel that it was his fault his friend was so spaced out. Jonghyun had thought about bringing the topic of the kiss up with Key, but the more he thought about it, the more he hated the idea of having to confess how he was feeling. He needed to talk to someone, get his mind of things. "Onew?" He was in the kitchen, preparing a very late lunch for the tired members of SHINee. "We don&apos;t have any chicken," he mused, searching through the freezer. "What&apos;s up, Jjong?" He took his head out of the freezer to look at his friend. "Hit me," Onew replied, leaning against the kitchen counter. Onew was a surprisingly good listener when he wanted to be - just not very good at giving advice. "I did something... completely stupid," Jonghyun managed to say, as he put his hand over his face, embarrassed, more than anything. He peaked through his fingers to find Onew staring at him expectantly with an eyebrow raised. "And I need your help." "I don&apos;t know if I&apos;m the best person to ask," Onew laughed, shaking his head. Jonghyun knew he was right, but there was no one else. Plus, Jinki was pretty open-minded when it came to most things. "I may have, well, done something that a friend wouldn&apos;t do with... another friend." "If you&apos;re talking about the thing that happened with Taemin--" Onew started, but he was cut off. "It&apos;s got nothing to do with Taemin," he said in a low voice. Onew&apos;s eyes widened, but he quickly recovered from his surprise. "Jonghyun, I&apos;d love to help you, but there is no way I can possibly do anything if you don&apos;t tell me what&apos;s wrong," he said with an excited edge to his tone, as if he had been waiting for this - as if he knew what Jonghyun was about to confess.. Jonghyun swore, pacing the room. Was it that obvious? He was so close to having a mental breakdown at this point. Finally, he built up the courage to form those three words, which could effectively ruin his friendship with Onew forever. "I kissed Key," Jonghyun groaned. Onew&apos;s eyes widened yet again, but he quickly regained his composure and wrapped his arms around Jonghyun. Unsure of what to do about the overly dramatic short boy, Onew simply patted him on the head repeatedly and murmured some phrases he thought sounded comforting. "What&apos;s so bad about that? Did he reject you?" Onew questioned and Jonghyun lifted his head, surprised at how well his friend had taken it. "Well, no, he kissed me back, but we haven&apos;t spoken since and..." he trailed off, unsure how Onew was taking this so well and not freaking out like he was. "If he kissed you back, then surely he likes you. You have nothing to worry about, Jjong. Key really likes you, I can tell by the way he looks at you - the way he blushes every time you make conversation. He is infatuated with you, Jjong, and you&apos;d be blind not to see it." "You think so?" Jonghyun whispered, hardly believing what he was hearing. "When did you turn so wise?" "This isn&apos;t wisdom," Onew laughed. "This is common sense." He pulled away and held Jonghyun at arm&apos;s length. "You know, sometimes I wish I had someone - just like you have Key." Jonghyun grinned. "You&apos;ll find someone soon enough. You&apos;re too sweet!" he grinned, wrapping his arms around his friend once more before running out of the kitchen to find Key. This was his chance to make things right.